• The Sociocultural Level and the "Person"
To Leyla, whose sustainment andunderstanding enabled me to complete this book. Cover Painting: Creative Man by Dane Rudhyar. This title was first published by Quest Books, 1980. A special thanks goes to Douglas MacFarlane of www.mindfire.ca for his help in preparing the text of this online edition. The All-Seeing Eye knows if you haven't made a voluntary donation to view this online book. The suggested contribution is $12, but you may offer as little as $3 or as much as $50. The Amazon.com Honor System make's it safe and easy. You can help the work of the Rudhyar Archival Project! Please make a donation today! This book could be called my astrological testament, in the sense that it brings to a conclusion my attempt to reformulate and give a new direction to modern astrology. The first part of this 45-year-long endeavor began in 1933 when I started to write for the then new magazine American Astrology, founded by Paul Clancy, a series of monthly articles which was to last for more than twenty years. The first group of articles was used as a foundation for my book, The Astrology of Personality, published in 1936 at the request of Alice Bailey who had started the Lucis Press in New York. This first part of my astrological work was brought to a conclusion in 1969 when I formed the International Committee for a Humanistic Astrology (ICHA) and wrote six essays now published as Person-Centered Astrology (N.Y.: A.S.I. Publishers). The second part began with the publication of From Humanistic to Transpersonal Astrology (Palo Alto, CA: Seed Center, 1975) and The Sun Also a Star: The Galactic Dimension of Astrology (N.Y.:A.S.I. Publishers). This present volume concludes what I am able to say concerning what I call "transpersonal astrology." I began to use the term transpersonal in 1930, long before the movement of transpersonal psychology was started, and with a meaning quite different from the one the word has recently taken on in the field of psychology. I defined as transpersonal a process of "descent" of transcendent spiritual power and illumination through the normal consciousness, and eventually through the whole personality of a human being. The source of that power and light exists in a realm "beyond" the personal consciousness and the ego, but I saw in the transpersonal action a descent of power rather than an ascent of a person's consciousness and emotions. In traditional religious terms, as a man prays to God his soul reaches up to the Divine; and God answers by an outpouring of "grace" — a descent of the Holy Spirit. The transpersonal approach I have been presenting does not follow any strictly religious system of thought; neither is it "mystical" in the usual sense of the term. It is essentially metaphysical and cosmological — or one may say cosmontological, as it refers to cosmic "being" (ontos). The term metaphysical, however, need not frighten anyone, because as I am using it, it simply refers to the expansion and generalization of very concrete, universal experiences and everyday modes of operation. For example, the two basic approaches to life-situations and personal problems I discuss in the first chapter of this book are matters of common human experience. All I have done is to go to the root of what they reveal, and to show that they can be related to opposite, yet from a more inclusive point of view, complementary cosmic polarities — the same polarities Chinese philosophy has named Yin and Yang. Thus, basic human experience provides the foundation for what can become, potentially at least, powerful symbols evoking new possibilities in our lives. Unfortunately, however, most people are still unaware of the immense power of the symbols, and of the complex sequences of symbols forming the great mythos on which culture is always based. Perhaps most unfortunate yet, many young people grossly underestimate, or refuse to consider, the effect on what they call their "personal" lives of the symbols of the culture in which they have been born and raised. Especially because of the transcendent character of the transpersonal approach to life I have been presenting, I have had to use symbols to convey its basic realizations. Astrology is the main symbol I have been using. It deals with the central problem of human existence, because it refers to the most basic of all such problems: the meaning of the relationship between man and the universe of which he is a part. It does so because the prima materia, as it were, of astrology refers to the most primordial and universal of all human experiences (at least, as far as our present humanity is concerned): the experience of the sky in its day and night aspects, thus of light and darkness, of waking consciousness and sleep. What astrology essentially does is merely to interpret this experience of the sky. It can be, and always has been, interpreted in two ways: (1) the symbolic and evocative way, which sees in the whole sky and the ordered motions of the lights of Sun, Moon, planets, and stars a revelation of the order of earthly nature in as well as outside of man — and, (2) the empirical and descriptive way, which seeks to give a systematic formulation to the correspondence between recurring events in nature and periodic changes in the positions of, and interrelationships among celestial bodies. Today astronomy presents us with a picture of the sky fundamentally different from the ancient worldview. The human perspective has radically changed. We no longer think of the dualism of sky and earth, above and below. We are aware of the Earth as a planet within a solar system, which is but a small unit in an immense system of stars, the Milky Way Galaxy — itself in turn only one of apparently billions of galaxies. Whether all these galaxies are contained within a closed space, the universe, or whether they spread out into infinite space — we really do not know, even if many theories have been advanced. Similarly, the validity of the picture of the constitution of human beings which our Western civilization had built on the foundation provided by the Hebraic and Greco-Latin tradition has been challenged in several ways since the mid-nineteenth century. The dualism of body and soul, of the human animal wedded to an angel, is giving way to the more complex concept of levels (or "planes") of being — of consciousness and activity. 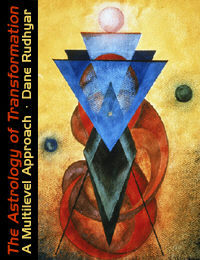 Such a concept is the foundation for not only the new and transpersonal approach to astrology I have initiated, but also for a multilevel kind of psychology which I had envisioned a long time ago — particularly in a large, unpublished volume, The Age of Plenitude (1942) — and about which I have lectured in recent years. This approach to psychology was more specifically outlined in my most recently published book, Beyond Individualism; The Psychology of Transformation (Wheaton, IL; Quest Books, 1979). This present volume rnot only adapts to astrological thinking and practice that multilevel approach to an understanding of Man (in the archetypal and non-sexual sense of the term), but it adds many new details to the formulations presented in Beyond Individualism. In this present book, the word "astrologer" could in most instances be replaced by "psychologist", for my approach to the immensely complex problems engendered by the mere fact of living in our city-dominated society transcends strictly defined categories of thought. Understanding and, whenever possible, applying this multilevel approach is of paramount importance in any study of the development of societies and their cultures as well as of the growth of individual human beings. Every person, since birth, has been totally conditioned by the assumptions or beliefs of the culture in which he or she has grown up. The power of these assumptions and of the collective mentality formed by usually rigid religious, philosophical, or scientific concepts or dogmas is nearly as great as that of biological drives; and at times culture can overcome biology. In the first chapter of this book, I have defined what I consider two basic ways in which human beings can meet the experiences of their everyday living. These two ways also refer to the characteristic spirit that pervades and ensouls a culture, its institutions, its basic philosophy, art-forms, and literature. At least for the last millennium, our Western civilization has powerfully stressed one of these two approaches to life, and in so doing it has produced both a spectacularly effective technology based on a relative mastery of material processes, and an increasingly ominous worldwide situation that could easily spell disaster. The other approach to life-situations and psychological problems is usually not well understood, because its character and implications have been presented in what, to our Euro-American mentality, seems to be a far too subjective, confusing, and naively symbolical manner by the men and cultures that have followed this approach. Symbols have, inevitably, to be used when trying to convey the meaning of this way of life, because it eludes precise intellectual and rationalistic definitions; but symbols can be used in different ways, and new ones more befitting the Western mind are now available.